Giveaways in People’s Park come and go like buses. Park regulars are regularly nourished by Food Not Bombs and the Catholic Worker, as well as food drops from nearby dormitories (left-over event trays), neighbors, and the public. Cast-off clothing, shoes, knick-knacks, and souvenirs–abound, often strewn about at various spots, since park managers banned a park free-clothes box in 1996. People’s Park regulars have become savvy shoppers. Just Shopping. Photo by Ted Friedman. Bellicose Berkeley spawned the Unabomber and now it presents the Durant ding-dong demolitionist. An explosion on Durant, late Saturday drew jolted nearby apartment dwellers to the scene. Here on Berkeley’s explosive South Side, we’re used to explosions. We had two explosions near Bancroft twice recently. We’re used to emergency vehicles and a bull-like bomb-sniffing German Shepard. The hooligans, who shot off guns, last year near a crowded Telegraph ice-cream stand were never found. The shootists left evidence–eight bullet casings. Police, who investigated the blast, Saturday, reportedly found no comparable physical evidence. Spring break broke that night. Was this a college prank-farewell or some Unabomber-wish-he-were detonating a blast? 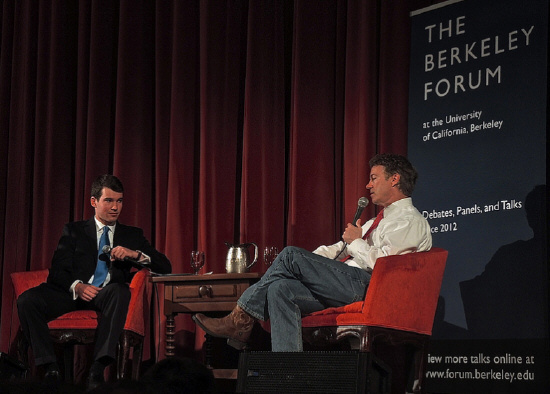 After Rand Paul’s Don’t Spy on Me Tour in the belly of Berkeley’s radical beast, Wednesday …. Let’s sort this out together. 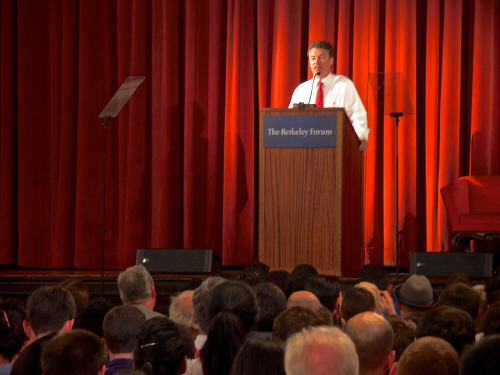 Paul, leading polls as the Republican presidential candidate, spoke a half-mile from Ho-Chi-Minh park. Next-door to a million dollar tree-sit demo that lasted more than two years. Nestled in the lower Berkeley hills, which were under FBI surveillance 55 years ago. A stone’s throw from Berkeley’s People’s Park. Two blocks from Sproul Plaza, with its plaque commemorating Berkeley’s Free Speech Movement. Is this belly of the beast enough? Rand Paul, right. Photo by Ted Friedman. Amid tight security, Rand Paul, who has made it a point to take on liberals on their own ground told 500 of his faithful Wednesday at U.C. Berkeley’s International House that the government was spying on him, you, and me. Eight downtown Berkeley Ambassadors moved uptown, Friday, starting cleanup work on Telegraph Avenue at 7.a.m. and working furiously until early afternoon to make a splash. Telegraph Property Owners’ Roland Peterson called the event a “splash.” He said “splash” was a public relations term. 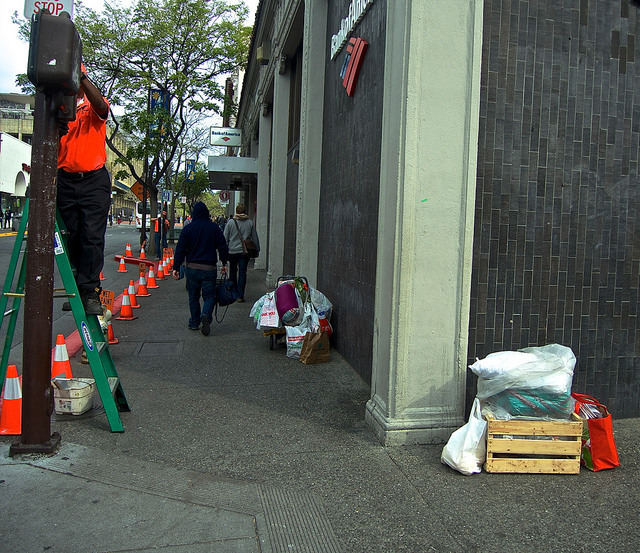 But if the ambassadors’ seeming success at clearing downtown streets of sprawling sidewalk encampments and their welfare referrals have paid off–as Telegraph property owners believe–they want that splash on Telegraph. Clean-up near shopping carts. Photo by Ted Friedman. “If you want freedom of the press,” our journalism professors told us,”own your own paper.” That alone was worth the price of admission and admission was cheap. Soon they were requiring mastering the letter-press, and the Speed Graphlex larger-than-a-bread-box view camera. They offered a course in smoke signals and tom-tom telegraphy, but those were optional. A fellow journ student distinguished himself by eating toilet paper, then regurgitating the pulp and making news print. Our professors’ idea was to force us back to Franklin, if not Neanderthals and cold meat. NEW TELEY AMBASSADOR’S: CHANGE OR CRACKDOWN? A dozen downtown Berkeley ambassadors, who cleaned up downtown last year at the same time cops cleared out some troublemakers, were hired this month to do the same on Telegraph, although with only two ambassadors. This could change nothing but minor looks on Teley or it could be prelude to a crackdown on street people There is no evidence of ambassador harassment of downtown street people, but Block by Block (which sponsors the ambassadors) has been criticized elsewhere for dislocating street people. Each ambassador program, BBB claims, is localized. 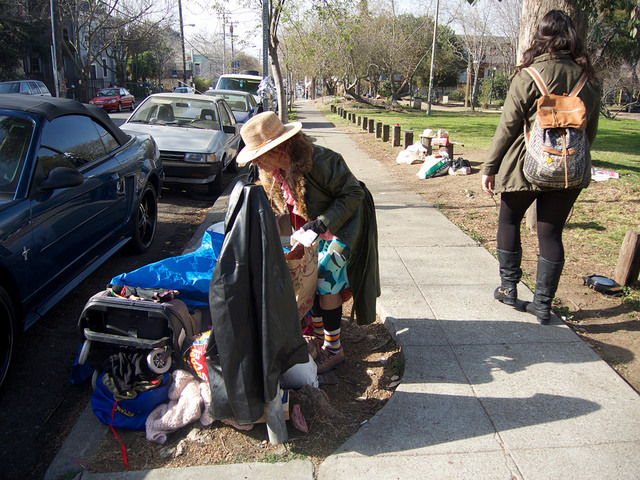 How Berkeley would it be for Berkeley ambassadors to sweep the streets of street people? Latest Scoop; 'Cream' reflected in window. Photo by Ted Friedman. Led by “Quirky Berkeley” founder, Tom Dalzell, ninety Berkeleyans snooped on their neighbors in the rain, Sunday, hunting North side Berkeley quirk. They were not disappointed, according to accompanying photos. Watch out, North side! Here come the tourists and they is us. 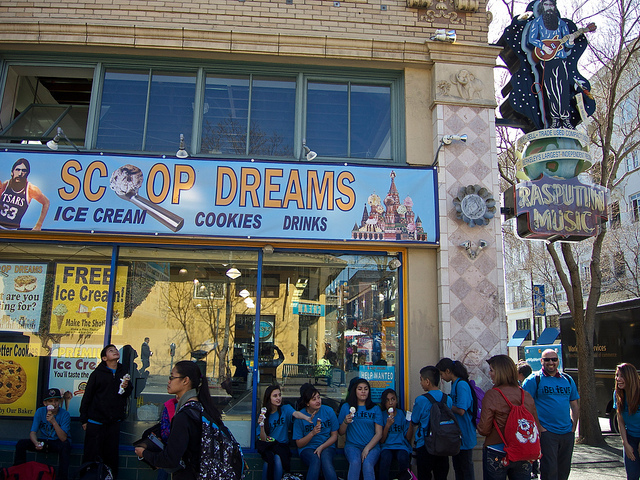 What next, tourists return to Telegraph Avenue? 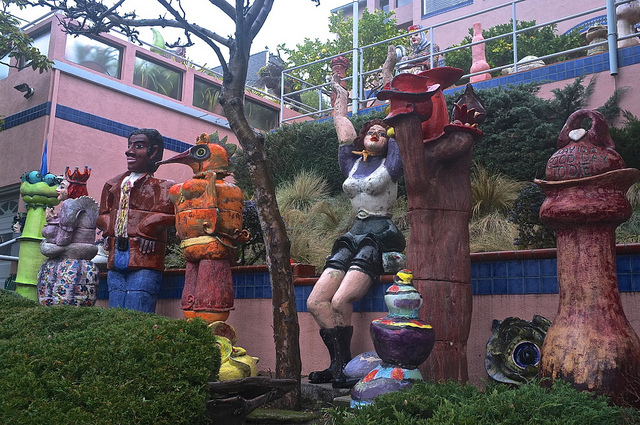 Quirky Berkeley front yard. Photo by Ted Friedman. I met the dead woman two weeks before she died, but only discovered my photos of her yesterday. You will be the first to see them. She had just scored impressive street-score near my apartment, a hop-skip-and a jump from People’s Park. Along with cool clothes and accessories, she had retrieved a labor-intensive souvenir doll from Del Toro, Panama. The doll would be expensive here. 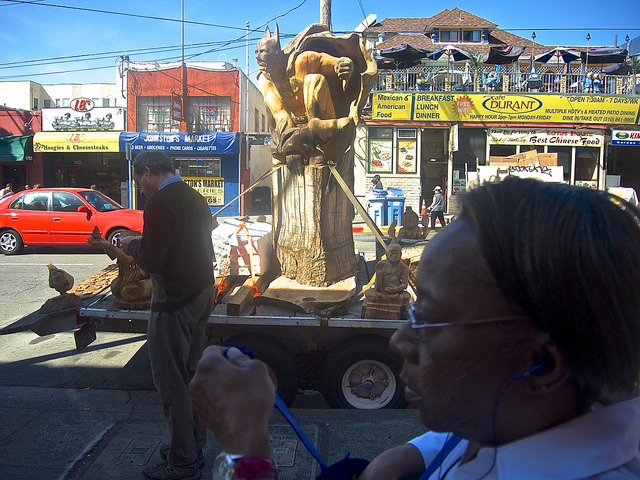 Berkeley’s South Side is awash in cast-off souvenirs. I’ve scored many of these vacation buys, which owners shed after the glow of vacation has dimmed. As I hoisted my camera, she held up the doll. Then I did something crazy. “I don’t usually pose my shots,” I bragged, “but would you lift that [doll’s] skirt?” Call it manipulated aleatory technique, call it sick; call it illegal. the Score. Photo by Ted Friedman.